The appearance of your driveway creates an impression about your home and way of life. 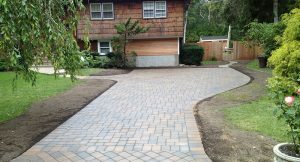 An inviting driveway provides a focal point for visitors approaching your home. With our attention to design and construction, your driveway will provide years of lasting service and an excellent return on investment. A patio is an essential element to any outdoor living space. 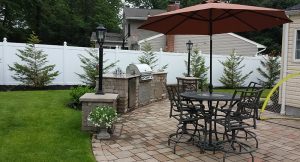 DiMassi and Son’s can design and install any shape or size patio using natural stone, pavers, or brick. We hand-select only the highest grade materials, then we tie it together with exceptional craftsmanship to bring your vision to life. Walkways are often the first encounter with your home, so it’s important to make sure they are professional. 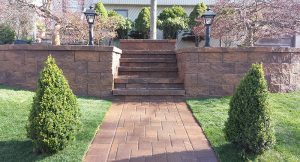 Our stone walkways and steps ensure the path to and from your home is easy to maneuver, looks amazing, and lasts. 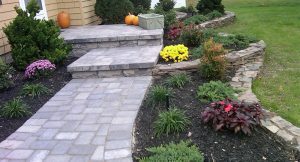 Backyards, frontyards, and sideyards, wherever your path may be, make it great with the expertise of Dimassi and Son’s Landscaping. 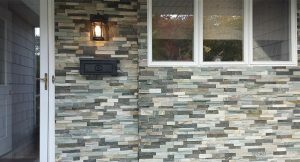 Giving your home a facelift by adding stone facing is the most cost-effective way to increase the curb appeal of your house. With endless stone and brick options to choose from, we can help you pick the style that will best complement and transform the look of your home. “Great walls make great neighbors.” We would like to expand on this quote by saying that walls can also add variety and create interest in your home’s landscape! A decorative seating wall can be the perfect complement to gardens, walkways, patios, outdoor kitchens, and more. From elegant water bowl features to beautiful rock waterfalls, the possibilities are endless. 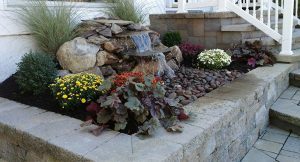 Not only does a relaxing and beautiful water feature bring years of extra enjoyment, but it’s also an investment that adds to the value of your new pool and home. Ready to take advantage of one of our landscaping services? Contact us!